Our movies and television shows and novels are full of stories about people who followed their hearts and ignored the crowd and did what they knew to be right. Even our national mythology is full of celebrated revolutionaries. When I was in school, they taught me that social protest and civil disobedience are wonderful things. In several high school and college classes, teachers stood up and proudly announced that their mission in life was to teach their students how to question authority. And I think that because of all this, I grew up thinking that external authority was, fundamentally, a repressive force: something that makes you do something that you don’t really want to do. But as I’ve grown older, I’ve realized that the world isn’t so simple. Because the truth is that the voice of authority is very alluring. Oftentimes, external authority is something very comforting: it’s something that gives us permission to not think unpleasant things about ourselves or the world. Because I, personally, think it’s impossible for any intelligent person to not feel completely adrift in the world. All of the ‘should’ questions–How should I live? Who should I marry? Where should I work? What should I strive for?–are so hopelessly murky that it oftentimes feels like a fool’s game to even attempt to answer them. Any individual who tries to make his or her own way in the world on the basis of their own intellect and emotions will, necessarily, think and feel and act in a somewhat tentative fashion. It’s very difficult–absent some kind of divine revelation–to feel any kind of sureness about anything. External authority is seductive not because it forces you to do things you don’t want to do, but because it gives you something to do. And not only does it provide you with answers, those answers are also, oftentimes, quite cunningly reasoned-out and accompanied by various external rewards. 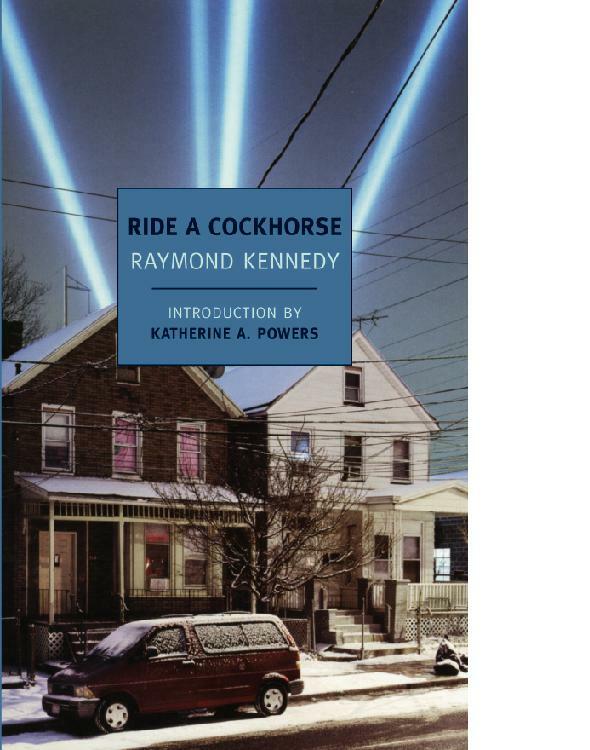 All of this has been a very long preface to me saying that I just finished reading Raymond Kennedy’s Ride A Cockhorse, which is about a middle-aged loan officer who, overnight, turns into a loquacious maniac and uses her newly-acquired wiles to enact a spontaneous takeover of her bank. The book is fantastic for two reasons. First, the voice of the book–which (even though it’s not in the first person) is primarily the voice of its main character, Frankie Fitzgibbons, is so tyrannically out-of-control that you just can’t stop reading. The things she does and thinks and feels are so outrageous that you surrender yourself to them. And the second thing is that the book displays tremendous perceptiveness regarding the allure of a person like Frankie. Basically, she’s able to attract, through her charisma, a coterie of devoted followers who, in some ways, are enticed and titillated precisely by the most awful aspects of her behavior. They revel in the way that she gives them permission to indulge their taste for cruelty and command, and for the way that she browbeats them and makes them feel like they are not in control of anything. To read this book is to become uncomfortable aware of how much we would all like someone to come into our lives and give us some kind of purpose. (Oh yeah, and it’s also kind of an allegory for Hitler. Frankie is, basically, elevated to the CEO-ship by beguiling the chairman and owner of the bank, who is a sort of Hindenburg figure. And even though he believes in the rules of good behavior himself, he is, in some ways, entranced by her vision of their bank as a resplendent and dominant institution. And, as a result, he allows her to continually break the limits that he’s set on her). The book is, of course, also just a wish-fulfillment fantasy. After reading so many novels about people who are beaten down by life, it’s wonderful to read about an average Joe who wakes up and discovers new potentialities in herself and manages to surpass all the expectations that anyone ever had for her. It’s also illuminative to remember that the injunction to question other sources of authority is how authoritarian movements establish their power and justify their severe attitudes toward dissent. The Nazis were, in their own minds, defending Germany against the ideology and tyranny of international Communism (and the imagined Global Jewish Conspiracy) while the Communists in turn were standing up against the ideology and tyranny of the capitalists, whose mercantile pioneers in turn were standing up against the tyranny of feudal aristocracy, and so on. It always starts with questioning that, underneath it all, already knows the answer, and that answer is that the Other is categorically wrong. This sounds like a great book, by the way. I think I might have to read it before the Coen Bros option it. That’s a surprisingly good analogy. The book _is_ alot like a Coen Brothers film. It has that same energy and sense of twisted satire. Also a good point re: authority co-opting the language of dissent. I think that is, to a certain extent, what’s going on when our government teaches us about how great Martin Luther King was. The idea there is that our current government is the heir to Dr. King and, thus, his tactics are no longer necessary. If we actually turned his tactics upon our government (as did, for instance, the Occupy Movement or the various right-wing tax protest movements), then it reacts with outrage.